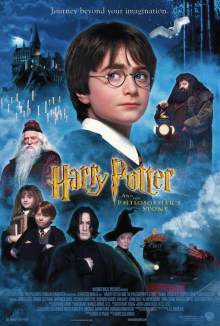 Harry Potter is a ten-year-old orphan who lives under the stairs of his Aunt Petunia and her family. In the classic tradition of children's stories, he is unloved and poorly cared for, a cinderella-like drudge waiting for a fairy godparent to rescue him. For Harry, this rescue comes when he approaches his 11th birthday. 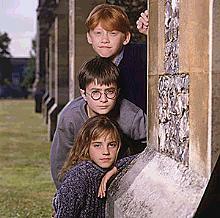 Movie Still, Dan Radcliffe, Rupert Grint and Emma Watson play Harry Potter, Ron Weasley and Hermione Granger in Harry Potter and the Sorcerer's Stone. Strange and magical things begin to happen, some seemingly caused by him, and when the family home is inundated by odd letters addressed to Harry, he discovers that he is destined to go to Hogwarts School of Witchcraft and Wizardry and become a thumpin' good wizard. Mystery-solving boarding school kids is a long-standing genre, one which this reviewer remembers fondly from a childhood reading very old annuals. The Phantom Four and others donned disguises, solved mysteries and righted wrongs. Even the idea of the wizarding school is not original, and Rowling's work is not the best of the genre. But timing and marketing are everything and getting kids to read is something to be proud of. Scriptwriter Steve Kloves (and director Chris Columbus) have brought to the screen a stronger story with better-developed characters that are found in the book. Ronald Weasley particularly is a much more endearing and interesting character. The few witty things he says in the books are retained, but the best of his part is all from Kloves. The film production is slick, though some of the computer graphics are less than successful, especially the stands in the Quidditch field. The scale is also more than a little strange with very small rooms for house areas. However there is also a lot that is successful, and the adults particularly give their performances a reality that is necessary to engage the audience. Alan Rickman as Professor Snape wields his masters' robes like a cape and is a glory to watch, Maggie Smith and Richard Harris are wonderful and de facto favily for the lonely Harry and for his friends, and Zoe Wanamaker's performance is only second to that of the costumer who put her in a gym uniform for riding gear. The musical score is a star, the story is well-paced and keeps the interest, and the material sufficiently true to the original material to keep the fans happy. If only the American's didn't feel the necessity to change the title. Sigh.